Turtle Hill transformed after a December snow. Snow brings magic. It animates the landscape, mounding shrubs and seed heads into soft-shouldered creatures and snow-capped sprites. It replaces gloom with brilliance, monotone ground with dramatic geometric patterns; it banishes winter’s early palette of gray and brown and paints the world new with white, blue, and gold. 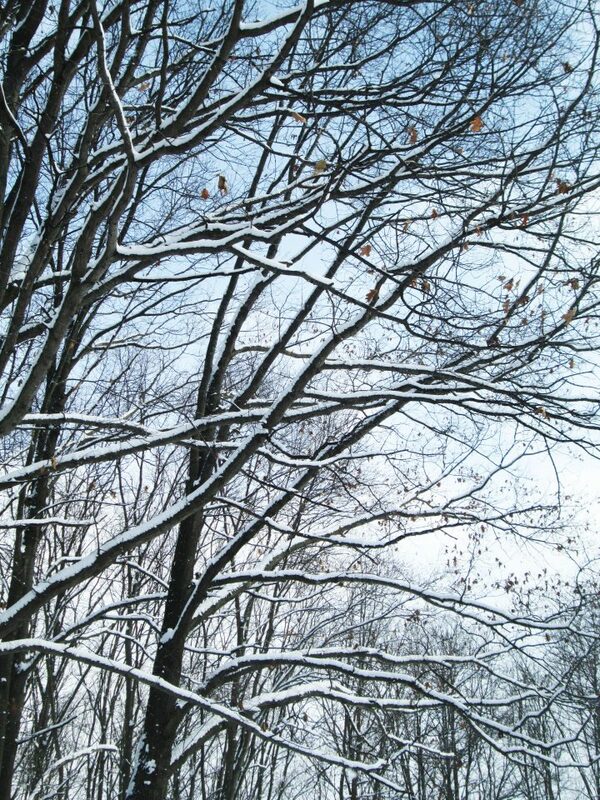 Snow takes my breath away – with its beauty, yes, and literally, when blown down my collar by a cutting wind. 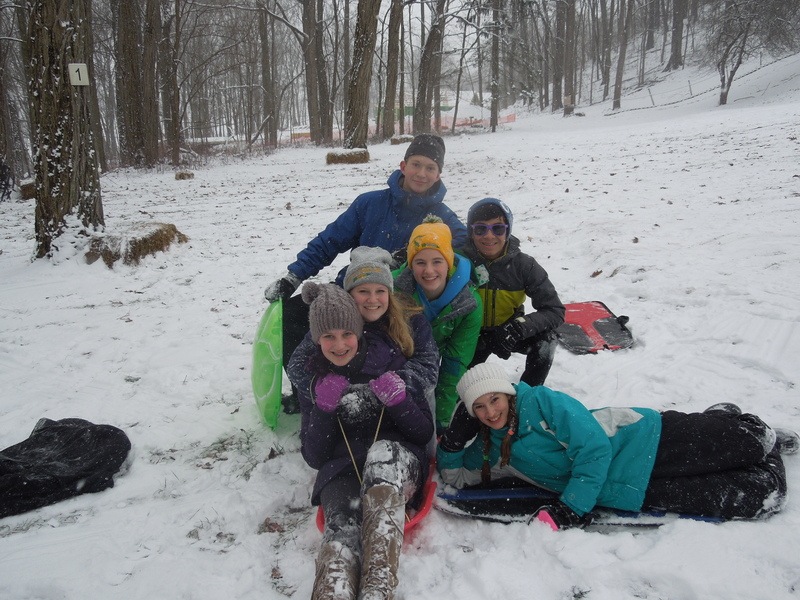 At Camp Friedenswald we’ve been living in winter wonder for the past several weeks, taking full advantage of the landscape-turned-playground with sledding, tubing, and cross-country skiing. 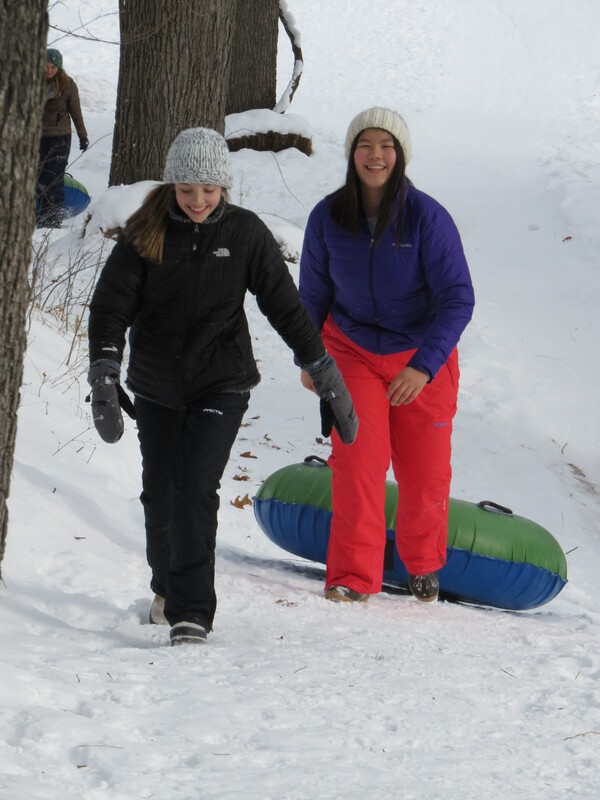 Our lodges have been humming with visitors, and we just finished two Winter Retreat weekends, thankful that we had plenty of snow for winter activities. As many would attest, one of the best parts of romping around in the cold and snow is coming back in to warm up. 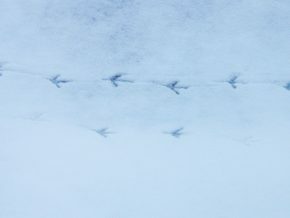 Songbirds leave little hieroglyphs as they hop around in the snow. Humans are brilliant at altering our immediate environment to suit our preferences, and we go to great lengths to avoid discomfort. How different from our non-human community are our methods of coping! Out and about bundled from head to toe in layers intended to keep out the wet and cold, one quickly notices that most creatures brave the elements in only a little more than what they were born with. Walking in the woods my boot prints join prints from the bare feet of white-tailed deer, eastern cottontail rabbits, various squirrels, wild turkeys, and tiny songbirds. From inside my home – scarved, gloved, long-underweared, heater running – I see a chipmunk scurry past the window wearing naught but fur. 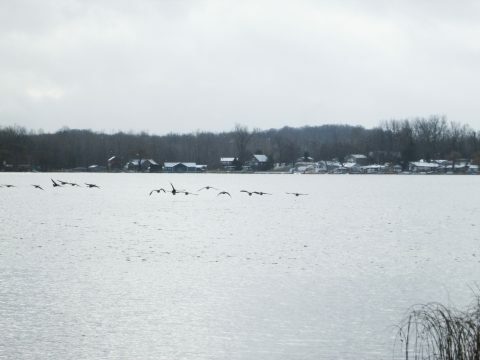 Canada geese winter where food supplies are plentiful, which is often in an agricultural area. Photo: pixabay. 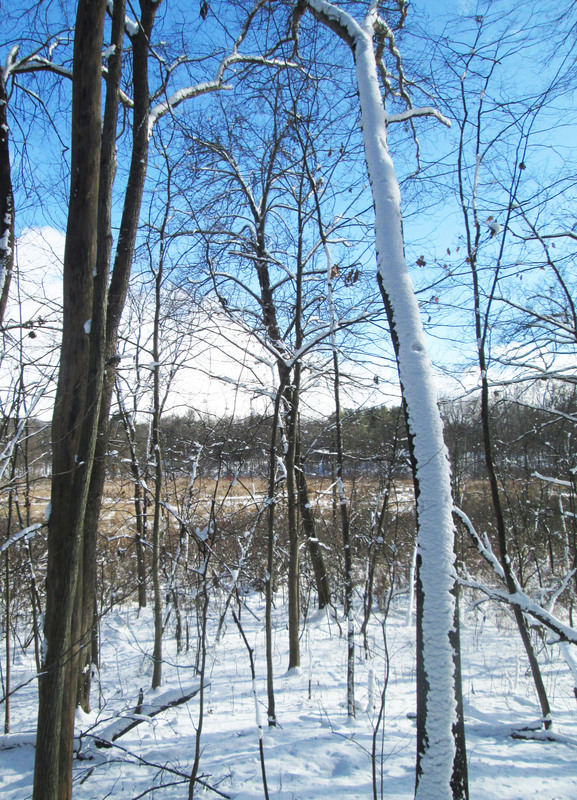 One area of Camp where you can almost always find animal activity during winter months is the prairie fen. 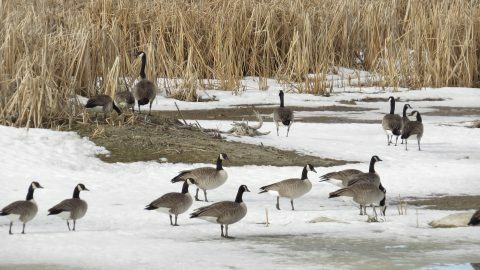 Walking past the fen one afternoon, I hear sandhill cranes and Canada geese call simultaneously, followed immediately by a frenzy of mallard ducks; a white-breasted nuthatch hops around a young oak, and a chickadee sounds its thin whistle. 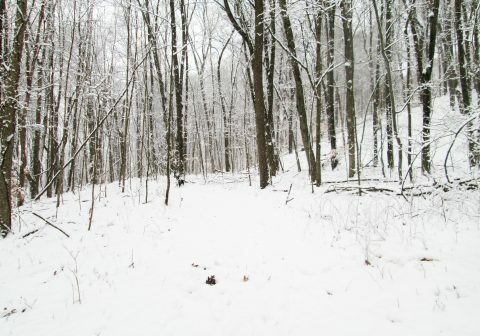 There is, additionally, evidence in the snow that at least four different mammal species visited the area that morning. All this in the space of maybe 30 yards. How on earth do these apparently stalwart creatures cope with conditions that make me cower? Animals adopt any of three strategies to get through the winter. Some opt to travel rather than endure scarce resources and cold, a different but no less mind-boggling feat of endurance. Travelers must first build up energy stores – hummingbirds eat enough to double their body weight – and then bear this extra weight as they head for greener pastures, sometimes thousands of miles away. Ruby-throated hummingbirds fly all the way to Mexico, for example, and the arctic tern may fly up to 44,000 miles in a year. Those that tough out the cold by shutting down do so to varying degrees, with some basically snoozing and others clinging to life by a thread. All reduce metabolism, lowering body temperature and oxygen consumption to limit fuel use. Some cold-blooded animals, including species of frog found here at Camp, survive extremely cold temperatures by undergoing chemical changes to lower the temperature at which body tissues freeze. Waterfowl can store an exceptional amount of body fat, and adaptive circulation in their legs and feet prevents excessive heat loss. There are, then, those animals that go about practically as if the world hasn’t changed from its summer self. These creatures may alter their appearance to better blend in with the environment, but most winter residents that we see at Camp undergo hidden changes, like building up a layer of insulating fat to get through the winter. 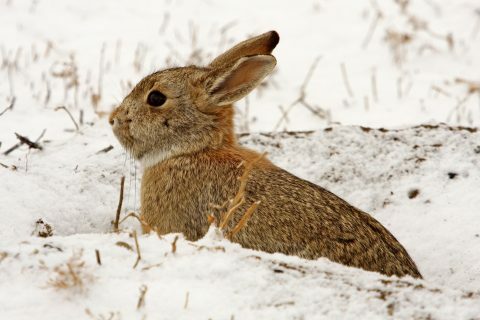 For any animal trying to survive colder temperatures, extra energy is required to maintain body heat, so sufficient fuel is critical, and animals must strike a careful balance between expending energy on foraging and slowing down to conserve. Some animals ensure their winter food supply by caching an impressive store in the fall, like the chickadee, whose brain grows extra cells during caching season for the sole purpose of remembering where next week’s dinner is. 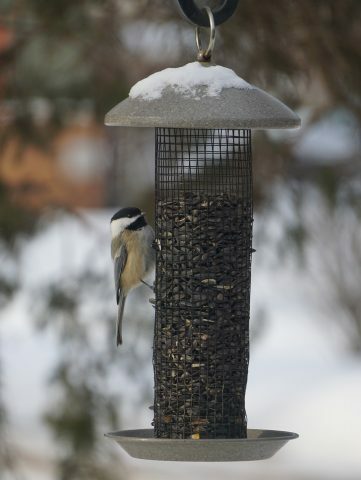 Chickadees are master cachers, and can find stashed seeds nearly a month later. Photo: pixabay. This morning as I pass the fen two Canada geese call back and forth to each other, and a flock of about 20 mallard ducks paddles off into the fog. I have my chin tucked into my coat and hands thrust in pockets, thinking the damp air especially cold despite the comparatively balmy 27 degrees. Several mallards erupt from the water, their vocalization like laughter. At my frailty? Who knows. But the laughter is contagious, shaking me from my stupor into amazement.